The impressive architecture of Casa Altilplano and its sophisticated decoration, reveal a mere inkling of the real "Magic of Careyes". 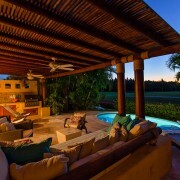 Casa Altiplano (The Highland) is located on a one acre lot above Playa Rosa Beach in the heart of Costa Careyes. This spectacular villa offers stunning south-oriented views and is in easy walking distance of the beach, the house is built in the traditional Mexican-Mediterranean style, and it contains a unique selection of artisans and materials. 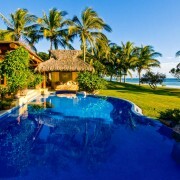 This beautiful 5 bedroom villa offer sweeping panoramic views of the coastline. The residence features a masterful design by renowned Italian builder Gian Franco Brignone. This magnificent villa blends a modern look with the primitive thatch "palapa" roof that merges with the natural landscape. 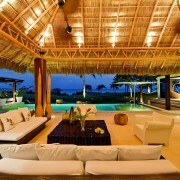 An open living/dining areas and a dramatic tropical landscaping create an atmosphere of elegant tranquility. 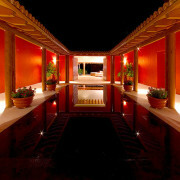 The wide infinity pool area includes lights, a heated Jacuzzi and cascade.